These products seem relatively unknown outside of Latin America and India. Read on if interested in dental caries. Very brief synopsis of Papacarie. A good review/overview of chemomechanical caries removal and comparison of products including Papacarie. Papacarie is a Portuguese word meaning ‘caries eater’. Papacarie gel was introduced in 2003 by Bussadori et al., and consists of papain enzyme, chloramine, toluidine blue, salts, preservatives, a thickener, stabilizers and deionized water (Fig. 5). Although Papacarie contains a small amount of chloramine, the main action depends on the presence of the papain enzyme. The chloramine was added to enhance removal of denatured tissues. Papain is a proteolytic enzyme with bactericidal and anti-inflammatory actions. It is extracted from the latex of leaves and fruits of the green adult Carica papaya tree. Most literature claims treatment time is about the same as traditional anesthesia & drill removal, but here is a counterexample. Brix3000 is claimed to be even faster due to the higher enzyme content . 2003 patent and 2012 patent on Papacarie by Marcia Boucas and Sandra Kalil Bussadori. A 2014 patent on Brix3000. A recent paper by one of the Papacarie authors. Example formulations using a different enzyme (bromelain). However, IIRC (can't find source I'd read) bromelain would attack healthy gum tissue unlike papain, but the reference is useful because it gives example "gel" formulations. Other literature does say papain isn't 100% specific to decayed collagen within the dentin (it had been demonstrated to degrade other select healthy collagen tissues, e.g. rat tail), but I believe bromelain is even less specific. Note these enzymes are marketed within salt as meat tenderizers, bromelain is also what burns your mouth when you eat raw or semi-cooked pineapple! The dye/colorant has a bactericidal effect. Also "toluidine blue act as photosensitive pigment that fixes into the bacterial membrane" . I am not interested in the time/cost aspects, but the feasibility of Papacarie treating root caries (along/below the gumline). Here are two articles on chemomechanical treatment of root caries . I don't know if cementum is issue. When I had a cavity recently treated, he said "it went into the root" and treated what he could reach with his drill, and the tooth remains sweet sensitive in the root (along the gumline). I believe Papacarie could help here! Looking around U.S. FDA documents, I did see Caridex premarket approval and Carisolv premarket approal. But nothing about Papacarie or Brix3000. U.S. FDA requires manufacturers, importers, and exporters to be registered with them, in combination with this 2015 U.S. FDA "Federal Registrar Notice" on papain containing products makes me worry my import would be seized. It doesn't mention Papacarie or Brix3000 explicitly, and only refers to cosmetic products, nothing dentistry related, but I think it's enough for a scrupulous customs employee to seize it? It is about $30 U.S.D. for a 1 ml Papacarie syringe from a Brazilian supplier, and reached $119 U.S.D. to import 1ml to the U.S. (would be much cheaper in bulk). Considering the import cost, risk of seizure, cost of chemicals, and what looks to be a simple preparation... it is cheaper to just make it myself. So, I think I'll use xanthan gum (or pectin?). I have some toluidine blue. I just need some papain powder and chloramine-T (though chloramine doesn't look strictly necessary). A criticism of chloramine usage is here, with a different papain-containing formulation (aforementioned 2014 patent), and resultant competing product that does appear to be more "shelf stable" unlike Papacarie which directions include removing from refrigerator 30 minutes prior to application. The product is called Brix3000, looks like they're more driven to sell/market it worldwide . Any suggestions appreciated, and I'll post a picture of the syringe I'd made! After creation, I think I'll apply it myself, use a hand tool to scrape away, then go pay a dentist to fill in the vacancy. I hope to see Papacarie/Brix3000 approved by the U.S. FDA eventually. I hope you enjoyed reading the compilation of my research into this matter, I thought I'd share. Motta LJ., et al. “Aesthetic restoration of deciduous anterior teeth after removal of carious tissue with Papacárie”. Indian Journal of Dental Research 20.1 (2009): 117-120. I'd since realized logical mistakes or poor interpretations I made in my last post having to do with Papacarie & Brix3000 differences. I don't recall what they were but the post wasn't meant to be exhaustive of my research anyway. My scale isn't the greatest (0.01g resolution). I ran out of good batteries so I screwed around by soldering 3 in series to get a voltage in the appropriate range. But it seemed to harm the accuracy, the reading would jump between 100 & 200 mg or something weird (I don't recall). A better scale is on my wishlist, as well as a 3v power supply to solder on (I guess linear supply better than switching due to the assumed design of the scale, but I'm not sure). So I just winged it without the scale by maximizing papain content within tap water, a tiny amount of toluidine blue (few grains of salt volume), and a bit of carboxymethyl cellulose (CMC) (used scale as heuristic on how much to add). Potent stuff, interesting smell too. Pictured I think the surface tension is too high for use (too viscous), but I thought I'd share anyway. A nice colour. I just stumbled across this thread. Thanks so much for posting it! I've been meaning to post about papacarie for years and glad you posted this. Basically, you apply the gel to the caries, and it's done when it stops bubbling. When it stops bubbling it means all of the bacteria has been dissolved away. Papacarie solves the problem of removing the bacteria laced rotten tissue in the tooth that would keep eating away at the tooth if not removed. Currently it is removed by a drill, but the drill removes much more tooth material than necessary. Papacarie gel removes just the amount of material necessary. Filling the tooth with currently available filling materials would thwart natural remineralization or regeneration of the tooth. Status quo dentists will tell you remineralization and regeneration is not possible, but it is possible. 1. How to remineralize/regenerate the tooth once the decayed material is removed. 2. How to remineralize/regenerate the tooth once the caries has reached the root? Currently it is done by root canal, removing the nerve effectively killing the tooth. Killing teeth leads to many serious health problems. I know for a fact one classical method of filling teeth has been propolis. It is a temperary filling and needs to be reapplied but it is cheap and you can do it yourself. Propolis is antibacterial and antiviral and has been said to help with the remineralization. Only problem I see with this is that it is a colored material and looks ugly especially on front teeth. If it can be matched with the color of your teeth and still manage to retain it's properties, that would be perfect! Even better, if a material can be made from propolis that would be more permanent and does not thwart remineralization/regeneration, that would be a game changer. I'm sure that if we put our minds to it here at science madness we can solve this issue. So what do I use to regrow limbs? Can you cite even one half baked credible study for the regrowth of teeth damaged by cavity? I apologize for lazy writing earlier, I should have taken more time to digging through my bookmarks to add references for my claims to assist not just myself but others. The second Papacarie patent (2012) proceeds the Brix3000 patent (2014). The Brix3000 patent doesn't cite the second Papacarie patent, just the 2003 patent, and claims one reason Brix3000 is better than Papacarie is because it doesn't require refrigeration. Neither recent formulation require refrigeration, however the 2003 formulation of Papacarie does state refrigeration is required. I don't know, I chickened out using it. Perhaps better to practice on animals with caries or ex-vivo than experiment on yourself. Note that while it may work on carious dentin/enamel, if there is remineralized enamel overlying the cavity you'd probably need a drill to get through that first. I suffer from severe xerostomia at a young age (starting abruptly age ~20), and without much saliva caries is a huge issue . The roof of my mouth and top sides are sandpaper in morning and during day without constant manual assistance. This condition was caused by the medical industry pushing non-medically indicated procedures on me (greed) combined with incompetence. I'm very bitter and driven in this issue. I expect to eventually have dentures at a young age, thus my research interests. A research question I have is the association between ionizing radiation exposure (CT scans, xrays), nutrient status, and long term salivary flow, given the trend of gradual decrease is salivary function through time , and the knowledge that atrophied salivary tissue doesn't regenerate. One thing to also consider is nutrient status with regard to calcium & phosphate as mentioned in papers like  (certainly better advice than the non-evidence based routine flossing dentists advise would be to advise routine consumption of 100%dv calcium instead). Filling the tooth with currently available filling materials would thwart natural remineralization or regeneration of the tooth. 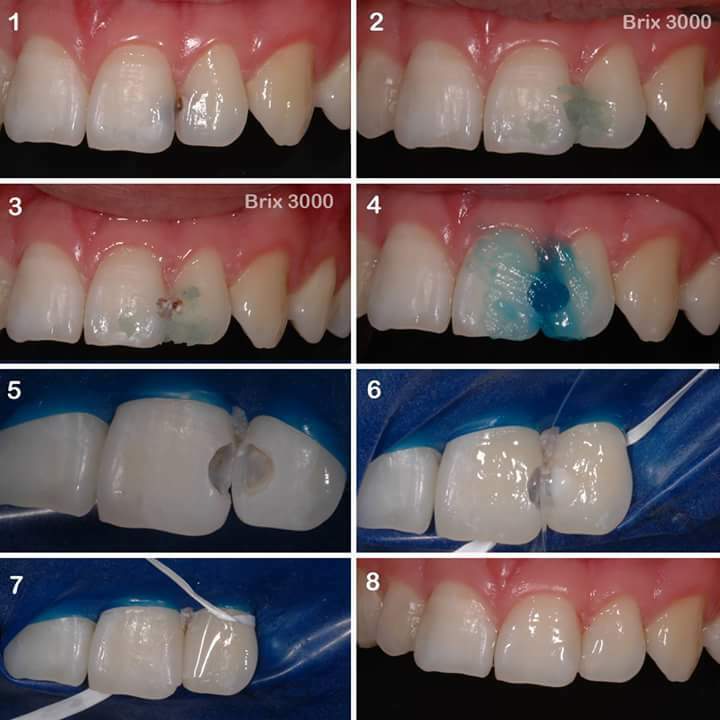 It would be nice to see biomimetic enamel produced as present filling materials are inferior to sound natural teeth (note the problem may be due to flaws in the naturally generated cusp or other problems in the first place , so remineralization wouldn't help). I wrote on a biomimetic enamel approach here. In this line of inquiry I'm hesitant about EDTA, as it is used in root canal therapy to clear lateral canals , and intuitively, could open up a lateral canal from the outside of the tooth into the pulp. More research questions here, as in if EDTA within the proposed solution is depositing biomimetic enamel would it also risk opening these lateral canals in the dentin (filled as a defense mechanism against approaching caries), possibly allowing bacteria deeper into the tooth? I think current filling materials are fine on the non-chewing surfaces and satisfy the need there. I'm curious how biomimetic enamel would compare in strength to existing restorations, hopefully as strong as natural enamel on the chewing surface (existing restorations are inferior). Status quo dentists will tell you remineralization and regeneration is not possible, but it is possible. Context is important, if the caries is solely within enamel then yes remineralization is possible, otherwise no: the caries must all be excavated. Personally I guess the word regeneration in this context should be reserved for animals with ever-growing teeth  or a volume additive process but I'm not sure what the appropriate nomenclature is. There is also a health condition where apatite crystallizes on the surface of the teeth, I believe due to the lack of the genotype producing the dental pellicle  which prevents that. I apologize I couldn't find an example of this or the name of this condition (it was interesting to see in a boy affected). If the bacteria reached the dentin and are sealed in they can sustain themselves on the collagen. However from my understanding fluoride in glass ionomer cement helps prevent secondary caries, i.e. fluoride helps prevent bacteria from reaching more nutrition (collagen) which would otherwise be reached by progressive acidic decay by lowering the critical pH of dentin (hydroxylapetite->fluoroapetite looses the OH- ion and adds the F- ion) in reaction to the lactic acid produced by bacterial metabolism (hydroxylapetite->apetite, looses the OH- ion due to pH, then F- will prefer to fill that void apetite->fluoroapetite). A good reference/overview is here. This is my understanding, don't treat it as irrefutable. I apologize about any poor articulation. One possibility is allergy/sensitivity to the gutta-percha or an additive . There are also problems with procedure (e.g. insufficient irrigation time). Also I believe root refers to below the gumline, pulp is the appropriate word in that context "once caries has reached the pulp" (perhaps the procedure should be called a pulp canal?). Agreed with the last sentence, but all the other stuff I hesitate. Temporary fillings aren't great as mentioned earlier, if the caries had reached the dentin it will keep progressing, perhaps more rapidly because there is no neutralization of the acid by saliva and the area is now enclosed. This is one big issue with trays as it enables localized low pH, especially if the user consumes coffee/acids/sugars before/during use. Plaster of paris works fine, dental stone is stronger but it's essentially the same stuff (particle size is different). I used a hair trimmer to vibrate bubbles out of the mold. Some thermoplastic sheets are in the bubblewrap. Mistakes I made with the first mold were I pulled one side instead of the center, so it broke. Also had bubbles, I should have used better procedure (e.g. fill half way then vibrate, then fill remainder then vibrate). One thought I'm having with growing biomimetic enamel is along the lines the authors used from  to . 's end result looks much better, perhaps the electromagnetic energy involved in  can be spread out over a long time, say overnight or multiple nights, instead of crammed into a 15 minute clinical appointment. Without the energy addition  would take a month or more of night application per mm, and I'm not sure how that would work out in-vivo with daily food mastication. I mean to experiment here simulating daily food mastication & night application ex-vivo, but my focus is on other health problems at this time. If you have any questions/feedback ask away I appreciate the interest. 2. If the caries has reached the pulp, it can be sealed with a biomimetic material to aid in remineralization. The RISK of bacterial infection of the pulp remains, BUT it is possible to kill off all bacteria inside the tooth with IR and NIR light and therefore avoid doing a root canal. IR and NIR goes deep into the bone and through the bone, killing all bacteria, healing the tooth. The decayed material that has been sterilized will over time calcify and become part of the healthy tooth structure. Now that I think about it, you may not even need to remove the decayed tooth material, just use IR AND NIR, it will sterilize the tooth and your whole mouth, and it is safe for bone and flesh. And my hypothesis is that it will even help regenerate and remineralize the teeth. Had the impression MSH might work. Other materials have been proposed. The counter argument to using MSH, was possibly triggering cancer. Gotta consider the reactionary nature of the medical establishment. Change is slow, and somebody has to pay for the research. Further, the GP has to be able to convert the process into a profit. Implants baby! Plenty of money in that! If the bacteria reached the dentin and are sealed in they can sustain themselves on the collagen. However from my understanding fluoride in glass ionomer cement helps prevent secondary caries, i.e. fluoride helps prevent bacteria from reaching more nutrition (collagen) which would otherwise be reached by progressive acidic decay by lowering the critical pH of dentin (hydroxylapetite->fluoroapetite looses the OH- ion and adds the F- ion) in reaction to the lactic acid produced by bacterial metabolism (hydroxylapetite->apetite, looses the OH- ion due to pH, then F- will prefer to fill that void apetite->fluoroapetite). I slaughtered that explanation with an error, sorry, lack of good sleep. Best to look at literature instead of my poor explanation. When it stops bubbling it means all of the bacteria has been dissolved away. Papacarie solves the problem of removing the bacteria laced rotten tissue in the tooth that would keep eating away at the tooth if not removed. Some bacteria remains, I've seen one or two studies showing slightly more exists post papacarie treatment than conventional treatment . Other interesting papers by one of the inventors of papacarie . In this line of inquiry I'm hesitant about EDTA, as it is used in root canal therapy to clear lateral canals , and intuitively, could open up a lateral canal from the outside of the tooth into the pulp. Again I made a mental mistake. I believe EDTA used in root canal therapy isn't saturated with Calcium, while HEDTA used in  is, so I don't believe there would be risk of opening the lateral canals, but certainly the conditions in which that could inadvertently occur should be investigated. I hope my research is fruitful. I hope to vary concentration on bovine teeth and see the end results via scanning electron microscope at the local uni. I expect I could replicate restoration strength tests too by looking at literature, to see how the results compare (maybe goad an engineering/physics undergrad into doing it while helping them write a paper). Brings to mind another research question I have, if implants increase the risk of cognitive decline via permanent jaw lesion enabling a pathogen easier access . There is a case study somewhere I'd read on the case of chronic sinusitis where an implant perforated the maxillary sinus. A culture was taken within the sinus and mouth to find what pathogen was the cause, they found bacteria normally found exclusively within the sinus to be within the mouth, and visa-versa. I can't find the case again, it was on pubmed somewhere, but I believe there is other literature showing the immunological burden these "innovations" place on the human. "Periodontal ligament" is a useful search term if you want to research this issue. I'd be interested to see what public data is available to see if a positive correlation can be found between dental implants and cognitive decline. There is interesting oxidation research on this topic as well, on oxidation burden where h2o2 is being produced via metal-ion catalyst (my conjecture on the metal-ion catalyst bit, might be in  explicitly somewhere), and antioxidants (enzyme, non-enzyme) being used up countering this issue (and synthesis of these antioxidants increased) . EDIT: Removed some speculative stuff. Lots of interesting material here to me I really need to focus on other stuff.